Posted at: 7/13/2011 01:39:00 AM . 4000 pages of fantasy, 1179 minutes of movies, and now it’s over. Harry Potter fans are both excited and saddened by the final installment of the series, Harry Potter and The Deathly Hallows Part II. As a long time fan of the world created by J.K. Rowling, I was excited to find myself invited to a screening of the film prior to its official release so that I could share my opinions with my readers about the film. Knowing that Harry Potter is extremely important to many people, I am very aware that some fans might start waving their wands and shouting “Avada Kedavra” if I spoil the final film by giving something away so I have chosen my words wisely. Part II began where part I ended with the final scene being repeated before the Warner Brother’s logo appeared. As the film begins, we are reminded of the dark times facing the wizarding world and sacrifices made in the name of good. The action finally begins about a half hour into the film and from then on it’s a roller coaster of emotions until the credits roll. Even knowing what was coming I found myself tearing up as battles were fought and characters changed forever. This final film showed a different side of many characters and truly makes you rethink everything you knew about them. A side note for those of you that have read the book, you will not be disappointed when Molly Weasley utters that famous line of hers during a battle. Julie Walters did an amazing job with the line delivery and you could really sense the passion in her facial expressions as she raised her wand. Battle scenes were intense, so be prepared if you were planning to take younger children with you because they might get scared. The film, following the book, finished the story in a way that leaves you wanting more yet offering closure for the story most of us spent the better part of our youth reading and watching. I only noticed one major change from the book and I personally liked the book’s version better for that scene. The film’s 3D didn’t seem like something that would be worth spending the extra $3 but it did add to the intensity during certain scenes. Additionally, unless David Yates found a real dragon hiding in the city of London, the CGI was realistic and not overused. My favorite non-plot part of this film was definitely the score. Alexandre Desplat filled scenes with instrumental magic which just added to the overall intensity of the film. Music can make or break a film and while most people don’t notice the subtle chord changes, I found they really amplified the emotions felt on screen. 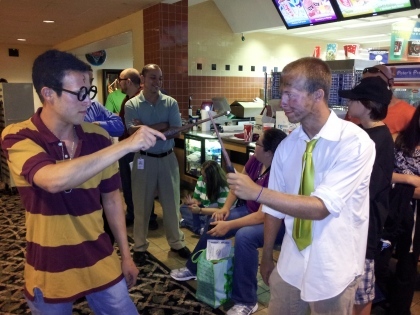 Overall I loved the movie, however you must remember that I have been obsessed with Harry Potter for over a decade. If you haven’t read the books or seen the first seven films, you will be lost because the story is a true continuation without the back story. I think anyone with any interest in Harry Potter will agree that the filmmakers stayed true to J.K. Rowling’s vision and finished the series in a way that will live on for generations as new Potter fans discover the magic. While the books and films might be over, stay tuned because Rowling recently announced the new website, PotterMore, which will be opening for beta testing on July 31, 2011 and going public in October. I am hoping to get into the beta testing and will keep everyone informed about the awesomeness.